Because buying flooring often means you’re looking to refurbish a room or even a whole home, it’s important to see it as a first step in a well thought through interior design plan. Your choice of vinyl or carpet – its colour, texture, fabric, pattern – provides the basis for a template that will run through your decisions around paint, wallpaper, curtains, blinds, furniture … even the way your rooms are laid out. 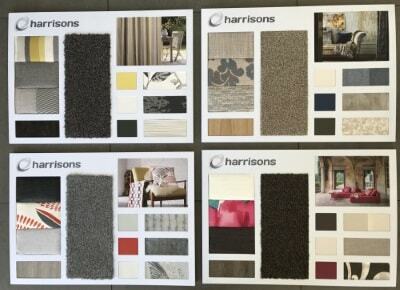 This means that a decision over new flooring has to take into consideration specific styles and fashions you might like to replicate through a room – and that’s why Harrisons Carpet has in-house designer Anita Shirley, who has created a series of mood boards to help homeowners visualise how a room might look depending on that initial choice. But it’s not enough to have just a standard set of templates. The world of interior design – just like any form of fashion – is constantly evolving, and that’s why Anita creates updated series of mood boards to reflect ongoing trends and to ensure that homeowners who want to refresh, refurbish or redesign have the chance to do so with the very latest styles. Anita produces a new set of mood boards each year in order to keep up with the latest styles. “There are a variety of ways in which a mood board collection evolves into being,” she says. “It could be from market feedback, supplier developments, trend forecasts, environmental inspiration or a combination of all of the above. The chance to show off a variety of fabrics, carpet and vinyl planks is vital, Anita says, when building a room’s look from the carpet up – but it’s more about creating options than dictating what must happen. “Franchisees have a set of four mood boards that are built on the four main colour choices people in New Zealand tend to go with: beige, chocolate brown, light grey and charcoal,” she says. “Then, from there, it’s just a matter of showing what fabrics you can choose and keeping everything in the right tone while still mixing and matching. This is what most people find difficult and where they tend to go wrong – you can still mix up different textures and colours, as long as you follow the same tone. “For example, with a charcoal carpet you would follow charcoal tones but because within charcoal you can also have lots of different shades, such as a green-grey, a blue-grey or a red-grey – you could then work with all those different colours and tones. Of course, all New Zealand homes and homeowners can’t be summed up in four mood boards – but they provide a great inspirational start to the process of designing a new room. And Anita says the Harrisons franchisees are also clued up on how the mood boards can work as an initial motivation to find a style for any sort of home. If you are looking for inspiration towards renovating a room or even a whole house, talk to one of our flooring experts about the best option for your lifestyle and space. As well as being able to visualise how your rooms might look through our new mood boards, we’ll give you a closer look at our vinyl ranges and show you how the carpets can perform in different conditions during a free in-home consultation with a Harrisons expert. Call us to book an appointment on 0800 421001, or fill out the booking form online.